Once in the open waters of Kinsale Bay we pass Sandycove Island. This beautiful island is uninhabited except for the many species of birds and the wild goats. The locals call this Goat Island. We set course for the Old Head of Kinsale; a magnificent peninsula stretching five miles out into the Atlantic from the mainland; home of the prestigious Old Head Golf Links; with dramatic sea-cliff scenery and teeming birdlife. 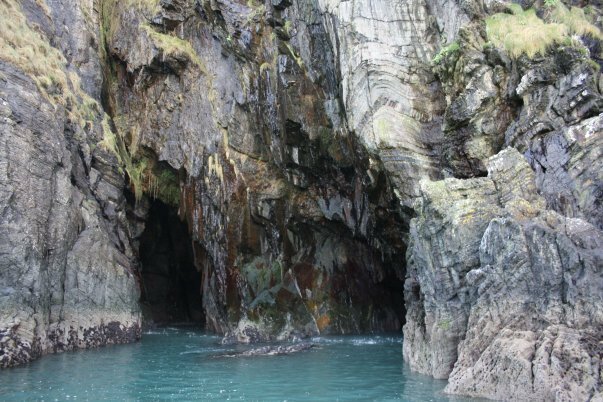 We take you in underneath the towering cliffs of the Old Head of Kinsale along to the open caves of Holeopen Bay East, snatching glimpses of Holeopen Bay West through the cliff. On a calm day we take the boat close to the mouth of the cave to listen to the many forms of birdlife that live there, like kittiwakes, guillemots and razorbills. On the route back to Kinsale we pass through the spectacular Sovereign Islands, home to a thousand gannets. We can pass the entrance to Oysterhaven Bay and pop around the corner to Newfoundland Bay with its abundance of cliffs and caves to explore. Along the way keep your eyes open for Dolphins, whales, basking sharks, seals, sunfish, diving gannets and the many species of wildlife that frequents our beautiful coastline. Once back in the inner harbour, soak in the panoramic view of the picturesque fishing village, before reaching dry land once more.